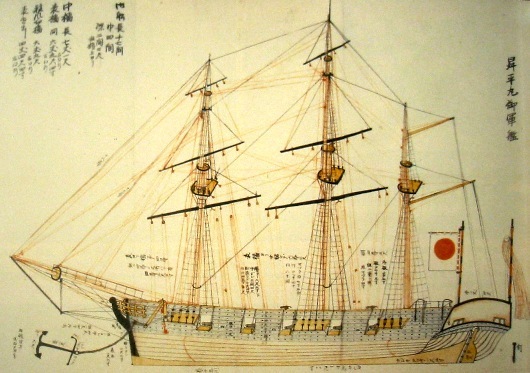 The Imperial Japanese Navy (or Nihon Kaigun) is part of the rich history of naval interaction between Japan and the Asian continent, including transportation of troops for invasions between the peninsula of Korea and Japan, with the beginning of the Kofun period in the third century and many other cultural and commerce exchange missions. As a consequence of the attempts of Japan invasion by Mongols, led by Khan in 1274, the interactions between Japan and continental Asia increased. These invasion attempts were done in 1274 and 1281. These events led to an increasing activity of Japanese ships wakō in the Chinese coast. The Wokou in Japanese: わこう Wakō translates to “Japanese pirates” or “dwarf pirates”. It is thought that the Wokou came from an ethnic mixture. 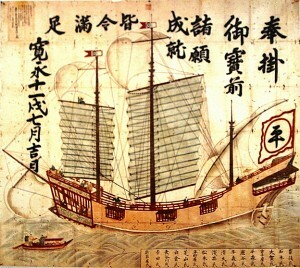 Painting of a Red seal ship from 1634 .Tokyo Naval Science Museum. During the history and depending on the Japanese leaders and governments, there were many different efforts to build a solid naval capability in Japan. One of these serious attempts was done on 16th century, during the Warring States period. At that time, many feudal rulers were fighting for supremacy and built vast coastal navies. In some cases, the fleets could consist of up to several hundred ships. It was the same period when Japan finally succeeded to developed one of the first ironclad warship. It was constructed by Oda Nobunaga, a Japanese daimyo, who had six iron-covered Oatakebune made in 1576. 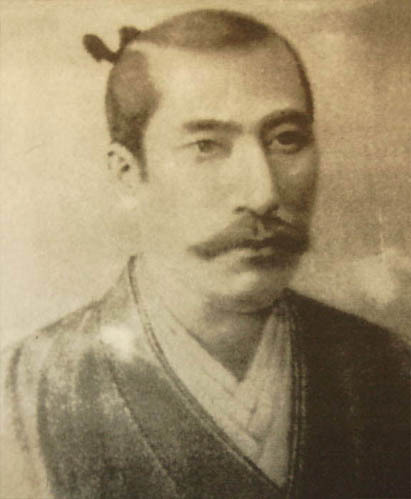 Just 12 years later, in 1588 Toyotomi Hideyoshi declared a ban on Wakō piracy. Then, immediately, the pirates became vassals of Hideyoshi. By doing, they formed a strong fleet that was used as naval invasion force for the conquest of Korea (1592–1598). From 1604, and as a consequence of contacts and exchanges with the Western nations, it was possible to commission about 350 Red seal ships, usually armed and prepared with latest Western technologies, with the purpose to estimulate commerce with Southeast Asian. A copy of a portrait of Oda Nobunaga painted by Italian Jesuit Giovanni Nicolao, probably commissioned by Oda himself. Because the strict and severe Japanese policy, called seclusion (“sakoku“), at early 1640 Japan lost more than 200 years in naval research and it was prevented to establish and negociate contacts with the foreign world and totally restricted the built of open sea-waters ships. 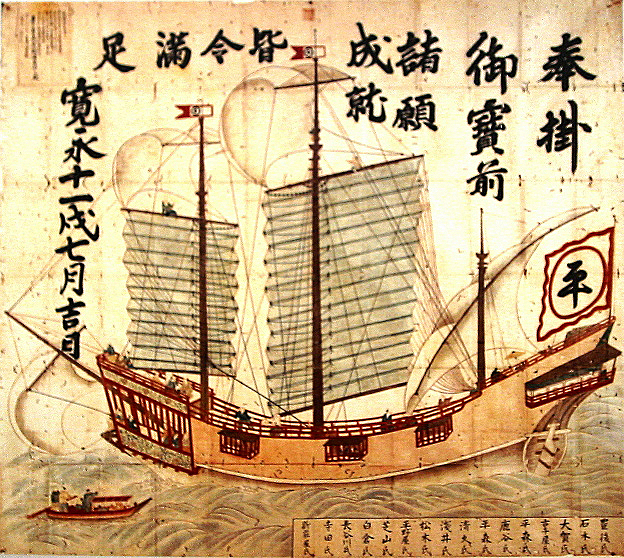 After a period of obscurity in naval developments, and as a consequence of the Morrison Incident occurred in early 1837, followed by news about the China’s defeat during the Opium War, motivated to the Shogunate to substitute the law to execute foreigners and instead to adopt the Order for the Provision of Firewood and Water. Simultaneously, The shogunate made efforts to strengthen the Japan’s coastal defenses. 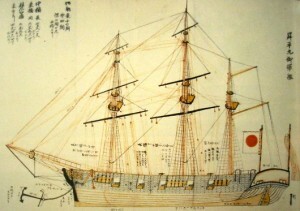 They had a feeling that modernization was necessary and that traditional ways would not be sufficient to repel further intrusions and western knowledge was utilized through the Dutch at Dejima to reinforce Japan’s capability to repel the foreigners; field guns, mortars and firearms were obtained and coastal defenses reinforced. Numerous attempts to open Japan ended in failure in part to Japanese resistance, this was done until the early 1850s. An important historical event happened between 1853 and 1854. Several American warships under the command of Commodore Matthew Perry entered Edo Bay and made demonstrations of force requesting trade and commerce negotiations. It is curious that they demanded negotiations when the use of force if not accepted was on the discussion table to. As a result, achieved in the Convention of Kanagawa, it was decided to open Japan to international trade and interaction. Few years later in 1858, it was followed by the 1858 Treaty of Amity and Commerce and treaties with other powers, bringing Japan officially to the International Society.